This is a Multi-Refill toner Bulk-Pack Set. Made for recharging Samsung CLP-415NW, Samsung CLX-4195FW, Samsung Xpress C1810W, Samsung Xpress C1860FW. Toner yields approximately 2,500pgs (BK) based on 5% page coverage per refill. The pack includes one BULK-SIZE refill bottle for Samsung CLT-K504S. 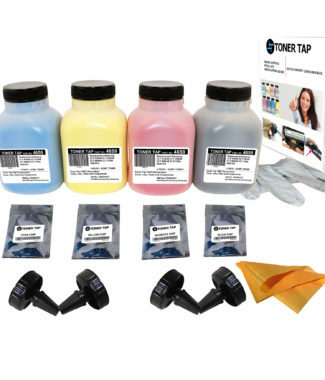 You can refill your black toner cartridge 4 times with this kit. Please note that this kit does not come with chips. Serviced and sold exclusively by Toner Tap. ✅Continental U.S. 48 States – Free Ground Shipping. ✅Orders normally ship within 24 hours of payment received. We will send a tracking number to the email associated with your account. International, Hawaii, Alaska, Puerto Rico and Canada – Additional shipping costs will be applied (please contact us for international shipping quotes). Please check your received item(s) thoroughly. Do not discard the original packaging material and box (outside & inside) as you may be required to return for inspection and replacement purposes. ✅100% FACTORY WARRANTY – your satisfaction is our top priority. Because we believe in the quality of our products, we will issue replacements if you experience any print defects due to a toner cartridge failure. Serviced EXCLUSIVELY by Toner Tap. We want to give you the best possible online shopping experience. If you need to contact us regarding any issues or concerns, we will gladly give you our full technical support.